Traffic queuing on the John Reid Road junction with Leam Lane and Newcastle Road in Jarrow. Image from the @NELiveTraffic camera network. Good morning, here is the latest from around the region's transport network. Traffic - There has been a breakdown in the northbound Tyne Tunnel, with staff dealing with the hold up. Updated at 9am. Traffic is slow on the A1(M) near Durham. It follows a stalled vehicle just after 7am, which left one lane blocked on the southbound from junction 63 at Chester-le-Street and Junction 62 at Carrville. Updated at 8.32am. Durham Constabulary has said the the A690 between Stonebridge and Langley Moor has now re-opened following an earlier road closure due to a burst water main. There are now temporary traffic lights in place which are still expected to cause slight delays. Northumbria Water are continuing to work to resolve the water mains burst which is effecting the area. Updated at 6.40am. 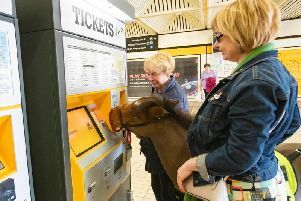 Tyne and Wear Metro - There are no reported issues. Shields Ferry - The ferry is running to normal time table today. Buses- Stagecoach, Go North East, Arriva North East - There are no delays or problems reported on the services. Durham Tees Valley Airport - There are no issues with the scheduled arrivals and departures.